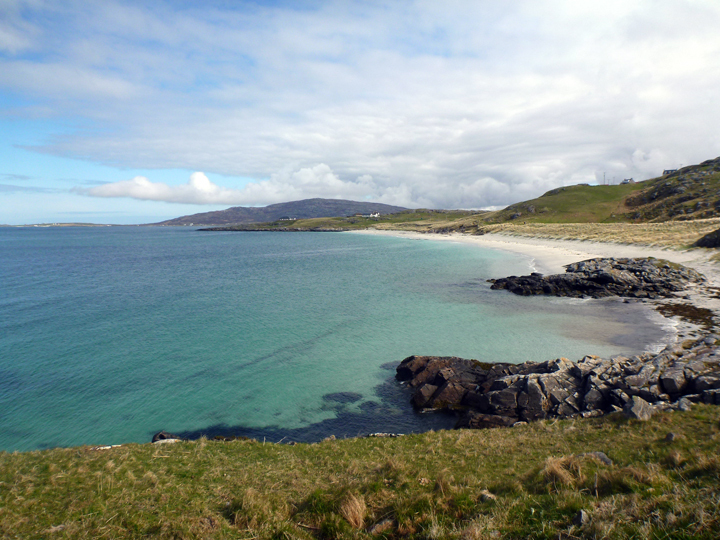 When the sun shines on the Scottish Hebrides, the islands and inlets, castles and cliff tops come to life as some of the most stunning landscapes in the world. The fulmars soar on stiff wings between the wave crests and the puffins wheel into their burrows tucked into grassy headlands. But as the fog rolls in, or the wind blows the grey sea until it froths and churns – then the Hebrides take on a primitive, mystic quality. They become a land where sheep, rabbits and red deer scurry for shelter on the treeless hillsides. 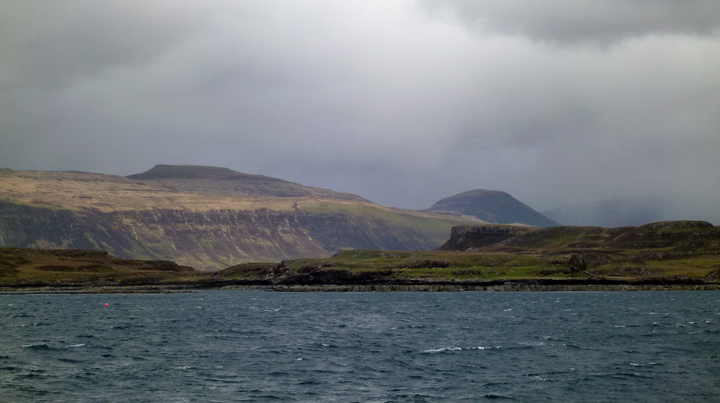 Isle of Skye in between hail storms. In the two short weeks I’ve been here, I’ve seen Scotland in several of its guises. The old saying I know from growing up in New England is all too relevant here, “If you don’t like the weather; wait a minute.” But you take the good with the bad, and when it’s good and you can land on a remote island by zodiac and hike up a hillside to lie on your belly and watch puffins building their nests just out of arm’s reach in front of you, well then, that’s not so bad. 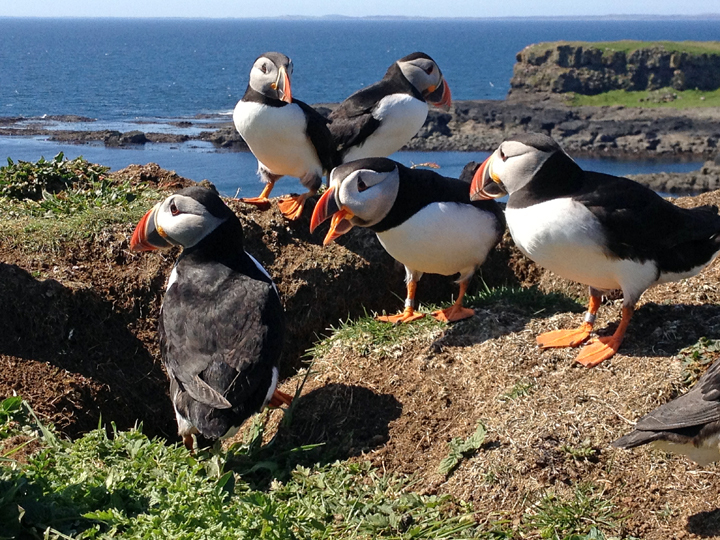 Watching the puffins nesting on Lunga while laying on my belly a few feet away. The remote outer islands are peppered with ancient standing stones and circular homesteads built of stone and known as brochs. Some are at least 1000 years older than Stonehenge. It’s a direct link to history to stand in the same places where people have been several thousand years before. 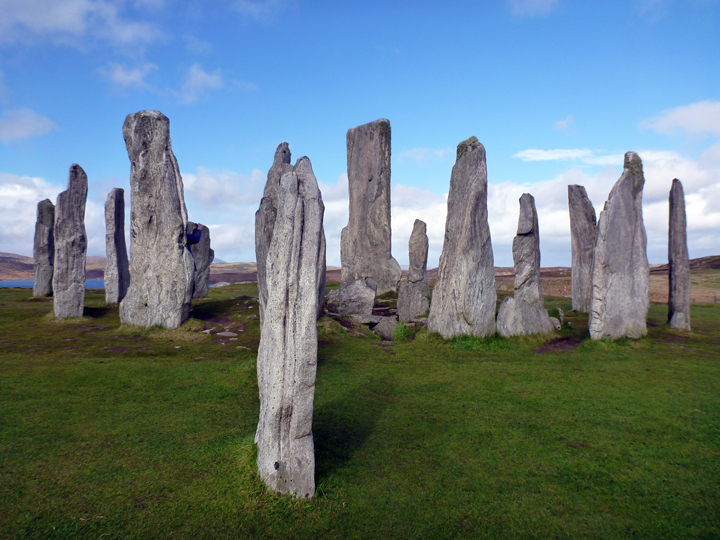 2000-year old standing stones in Callanish. Going back several thousands of years, I can imagine great glaciers covering this landscape because they have left behind tremendous U-shaped valleys, staggering mountains of moraine, and slick, polished rock walls. I hiked up to overlook this incredible loch or lake on the Isle of Skye. The sculpting of glaciers is all around here. I will spend a few more days on this west coast of Scotland and then head on up and around the north part of the country and down to the east coast and the port of Aberdeen. Stay tuned for another post about the next leg of my Scottish journey and cross your fingers for me that the weather is fair!